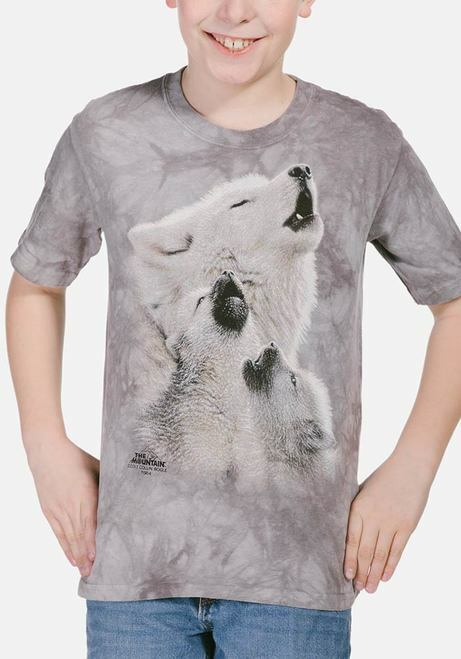 Kids Wolf Portrait t-shirt is the perfect design for children who love wolves. The wildlife design by Dave Merrick is a monochromatic portrait of a wolf's face with blue eyes. In the background there is a faded copy of this image and then again behind that is the faint artwork of it's eyes. Artist Corner: Dave Merrick is a world renowned artist from Colorado. He enjoys painting both portraits and wildlife. He has done many portraits of celebrities, presidents and cowboys. His astoundingly lifelike artwork can be found on t-shirts & giftware from The Mountain®.